The weather seems to finally have turned, and I’ve really been craving lighter, brighter flavors. It’s perfect timing, really, because the farmers’ markets around Boston are finally open for the season, which means that we can now shop at a farmers’ market in Providence or Boston nearly every day of the week. It’s really the beginning of the very best time of the year to cook and eat around these parts. The warmer weather also means that I love to escape from my windowless office whenever possible and take a lunchtime stroll up the North End to visit my favorite fishmongers. Liz and Keri always have beautiful fresh seafood, and it’s always a treat to visit their adorable shop, chat with them, and know that I’m bringing home something delicious to cook up. 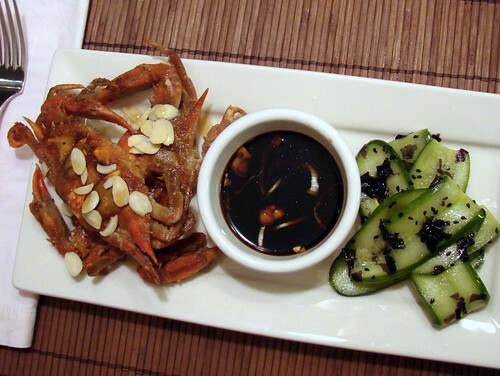 For the second week running, one of those delicious offerings from the sea was soft shell crabs, in season right now, and particularly sweet and tasty. Last week I soaked some in buttermilk, dredged them in flour, and served the crispy little guys on a “broken” basil and lemon puree; this time around I went with a different take. They got a super light coating of seasoned Wondra flour, then a brief saute in a hot pan slicked with a little bit of grapeseed oil, then I served them up with a sprinkle of slivered almonds and a dipping sauce composed of tamari, mirin, rice wine vinegar, shaved green garlic, and a little toasted sesame oil. 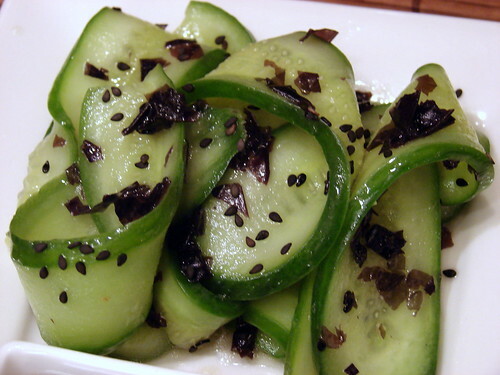 On the side, I served up a salad of cucumber ribbons dressed with a light rice wine vinaigrette, slivers of nori from She Sells Seaweed, and black sesame seeds, very much inspired by a dish we had at last years Farm Fresh RI Local Food Fest. Last night’s seafood preparation was even simpler. I had two gorgeous pieces of mahi mahi, which I salted, dried well, then seared in a bit of grapeseed oil until the skin was crackly-crisp. When I flipped the fish so the skin side was up, I added a nub of anchovy butter, which soaked into the flesh of the fish, infusing it with more rich flavor, and I served the seared filets on top of a basil and garlic scape citronette, with simply halved and salted tiny heirloom tomatoes from Kimball’s Fruit Farm scattered around. Quick, simple, delicious. My goal this year is to keep within distance of your wonderful cooking and photos- great post! I want soft shell crab! 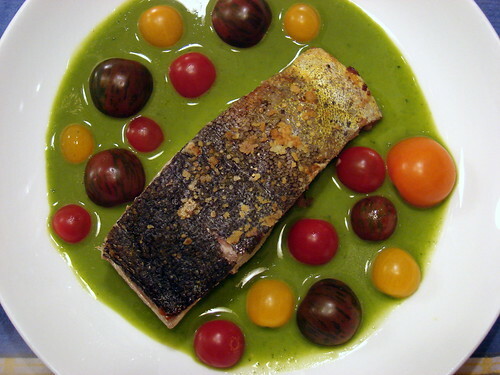 And that mahi mahi and tomatoes looks wonderfully whimsical to me. I think it’s because the tomatoes are like pretty bubbles against that green basil. Wonderful! I am jealous of your coastal fish choices, but you definitely have a way with it. 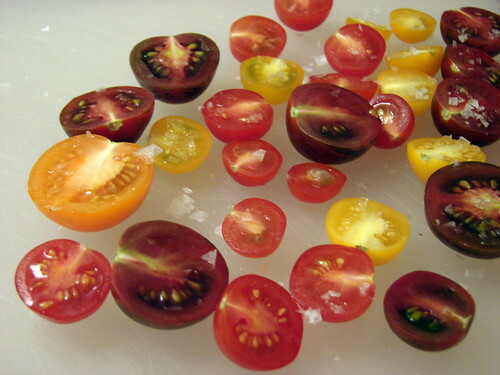 I just started seeing heirloom tomatoes in the market. What a great way to use them. I like when wannafoodie said that it looked whimsical. Love the soft shell prep. Bravo! 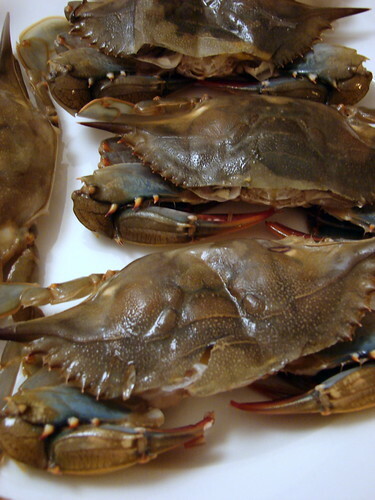 So…never having cooked softshells at home…only big ole crabs…do you have to cut the faces off yourself or does the fishmonger do it for you :-)? Once again, absolutely stunning photos. YUM! The presentation of the mahi mahi with the tomatoes is so cute! I lived in Providence once upon a time and love reading about your adventures there.